The AFC Champions League, commonly known as the Asian Champions League, is an annual continental club football competition organised by the Asian Football Confederation (AFC). Introduced in 2002, the competition is a continuation of the Asian Club Championship which had started in 1967. It is the premier club tournament in Asia, equivalent to the CONMEBOL Copa Libertadores, and the UEFA, CAF, CONCACAF and OFC Champions League competitions. A total of 32 clubs compete in the round robin group stage of the competition. Clubs from Asia's strongest national leagues receive automatic berths, with clubs from lower-ranked nations eligible to qualify via the qualifying playoffs, and they are also eligible to participate in the AFC Cup. Since 2009, the champions do not qualify automatically for the following year's competition. The winner of the AFC Champions League qualifies for the FIFA Club World Cup. The most successful club in the competition is the Pohang Steelers with a total of three titles. The reigning champions of the competition are the Kashima Antlers, who won the competition for the first time. The competition started as the Asian Club Championship, a tournament for the champions of each AFC nation, and had a variety of different formats, with the inaugural tournament staged as a straightforward knockout format and the following three editions consisting of a group stage. Israeli clubs dominated the first four editions of the competition, partly due to the refusal of Arab teams to face them. In 1970, Lebanese side Homenetmen refused to play against Hapoel Tel Aviv in the semi-final and Hapoel thus went straight to the final, while in 1971, Al-Shorta of Iraq refused to play against Maccabi Tel Aviv on two separate occasions in the tournament including the finale itself, with the Arab media considering the Iraqi side as the tournament's winners and the team holding an open top bus parade. After these two editions, the AFC decided that teams who refused to play matches for political reasons would be disqualified from the tournament, but this failed to act as a deterrent as the 1972 edition had to be cancelled after two Arab teams refused to commit to playing against Israeli side Maccabi Netanya. After this, the AFC stopped holding the competition and Israel were expelled from the confederation. Asia's premier club tournament made its return in 1985, and in 1990, the Asian Football Confederation introduced the Asian Cup Winners' Cup, a tournament for the cup winners of each AFC nation. The 1995 season saw the introduction of the Asian Super Cup where the winners of the Asian Club Championship and Asian Cup Winners' Cup faced against each other. The 2002–03 season saw the Asian Club Championship, Asian Cup Winners' Cup and Asian Super Cup combine to become the AFC Champions League. League champions and cup winners would qualify for the qualifying playoffs with the best eight clubs from East Asia and the eight best clubs from West Asia progressing to the group stage. The first winners under the AFC Champions League name were Al-Ain, defeating BEC Tero 2–1 on aggregate. In 2004, 29 clubs from fourteen countries participated and the tournament schedule was changed to March–November. In the group stage, the 28 clubs were divided into seven groups of four on a regional basis, separating East Asian and West Asian clubs to reduce travel costs, and the groups were played on a home and away basis. The seven group winners along with the defending champions qualified to the quarterfinals. The quarterfinals, semifinals, and finals were played as a two-legged format, with away goals, extra time, and penalties used as tie-breakers. The 2005 season saw Syrian clubs join the competition, thus increasing the number of participating countries to 15, and two years later, following their transfer into the AFC in 2006, Australian clubs were also included in the tournament. Owing to the lack of professionalism in Asian football, many problems still existed in the tournament, such as on field violence and late submission of player registration. Many blamed the lack of prize money and expensive travel cost as some of the reasons. The Champions League expanded to 32 clubs in 2009 with direct entry to the top ten Asian leagues. Each country received up to 4 slots, though no more than one-third of the number of teams in that country's top division, rounded downwards, depending on the strength of their league, league structure (professionalism), marketability, financial status, and other criteria set by the AFC Pro-League Committee. The assessment criteria and ranking for participating associations would be revised by AFC every two years. The current format sees the eight group winners and eight runners-up qualify to the Round of 16, in which group winners play host to the runners-up in two-legged series, matched regionally, with away goals, extra time, and penalties used as tie-breakers. The regional restriction continues all the way until the final, although clubs from the same country cannot face each other in the quarterfinals unless that country has three or more representatives in the quarterfinals. Since 2013, the final has also been held as a two-legged series, on a home and away basis. As of the 2009 edition of the tournament, the AFC Champions League has commenced with a double round-robin group stage of 32 teams, which is preceded by qualifying matches for teams that do not receive direct entry to the competition proper. Teams are also split into east and west zones to progress separately in the tournament. 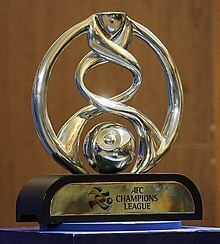 The number of teams that each association enters into the AFC Champions League is determined annually through criteria as set by the AFC Competitions Committee. The criteria, which is a modified version of the UEFA coefficient, measures such thing as marketability and stadia to determine the specific number of berths that an association receives. The higher an association's ranking as determined by the criteria, the more teams represent the association in the Champions League, and the fewer qualification rounds the association's teams must compete in. The tournament proper begins with a group stage of 32 teams, divided into eight groups. Seeding is used whilst making the draw for this stage, with teams from the same country not being drawn into groups together. The group stage is divided into two zones; the first zone is the four East Asian groups and the other zone is the four West Asian groups. Each team meets the others in its group home and away in a round-robin format. The winning team and the runners-up from each group then progress to the next round. For this stage, the winning team from one group plays against the runners-up from another group from their zone of the group stage. The tournament uses the away goals rule: if the aggregate score of the two games is tied after 180 minutes, then the team who scored more goals at their opponent's stadium advances. If still tied the clubs play extra time, where the away goals rule is no longer applied. If still tied after extra time, the tie shall be decided by a penalty shootout. East and West zones continue to be kept part until the final. The group stage and Round of 16 matches are played through the first half of the year (February–May), whilst the knock-out stage thereafter is played during the second half of the year (August–November). The knock-out ties are played in a two-legged format, including the final. Teams from only 19 AFC countries have reached the group stage of the AFC Champions League. The allocation of teams by member countries is listed below; asterisks represent occasions where at least one team was eliminated in qualification prior to the group stage. 32 AFC countries have had teams participate in qualification, and countries that have never had teams reach the group stage are not shown. Like the FIFA World Cup, the AFC Champions League is sponsored by a group of multinational corporations, in contrast to the single main sponsor typically found in national top-flight leagues. The current license holder for the AFC Champions League video game is Konami with the Pro Evolution Soccer series. The license also includes the competing teams. 1 Club no longer exists. 2 In 1974 the Israel FA was expelled from the AFC due to political pressure, and became a full UEFA member in 1994. As a result, Israeli clubs no longer participate in AFC tournaments but in their UEFA counterparts instead. Note: Israeli clubs, winners of the 1967, 1969 and 1971 editions, are not included. ^ "Al-Mal'ab Newspaper - April 1971 - Champions of Asia Return to Baghdad". Kooora (in Arabic). April 1971. ^ "Asian Football Confederation" (PDF). Archived from the original (PDF) on 5 February 2009. Retrieved 26 May 2008. ^ "Criteria for Participation in AFC Club Competitions" (PDF). Archived from the original (PDF) on 18 August 2012. Retrieved 5 January 2010. ^ a b "AFC ExCo okays ACL slots, format". The-afc.com. Archived from the original on 3 December 2013. Retrieved 4 July 2014. ^ AFC Champions League 2019 Competition Regulations. Asian Football Confederation. p. 57. Retrieved 13 February 2019. ^ "AFC appoints world-leading ball manufacturer Molten as official match ball supplier". www.the-afc.com. Retrieved 24 October 2018. ^ "AFC unveils Official Match Balls by Molten for 2019". www.the-afc.com. Retrieved 5 February 2019. ^ "AFC club competitions continue to grow in appeal with latest Kärcher deal". www.the-afc.com. Retrieved 24 October 2018. ^ "AFC announces multi-year partnership with Allianz". www.the-afc.com. Retrieved 24 October 2018. ^ "Toyota signs on as full AFC partner". www.the-afc.com. Retrieved 24 October 2018. ^ "AFC club competitions attract C'estbon deal". www.the-afc.com. Retrieved 24 October 2018. ^ "Agencies poised as AFC sets out new timeline for rights tender | Featured News| News | Sportcal". www.sportcal.com. Retrieved 24 October 2018. ^ "PES 2016". Konami-pes2013.com. Archived from the original on 12 October 2013. Retrieved 5 May 2016. ^ "PES 2016 licenses revealed!". Pro Evolution Soccer. Archived from the original on 18 September 2015. Retrieved 5 May 2016. ^ "Asian Champions' Cup". The Rec.Sport.Soccer Statistics Foundation. www.rsssf.com. Retrieved 11 November 2018. ^ "Archive – AFC Champions League". Soccerway.com. Retrieved 11 November 2018.